Starring: Chuck Norris, Louis Gossett Jr. Melody Anderson, Will Sampson, Sonny Landham, John Rhys-Davis, Ian Abercrombie. Plot: Max Donigan alongside his partner Leo Porter are both soldiers of fortune, both adventurers yet neither really gaining any means of fortune. A mysterious woman named Patricia creates a map of for a quest of treasure in Central America. Both men befriend Patricia and so begins their action packed, comical at times adventure. I remember seeing this as a child at the Drive-in. It’s one of those movies that always stuck with me and so adventuring into this film once again was a fond memory of long ago. This is only the second time, I have seen this old school 80’s film, and boy was it great seeing it once again. Olive Films has done a great job in picking this film for a release on both DVD and Blu-ray. This is the first time the film has ever been released on Blu-ray and I was very excited when I read the press announcement that it was going to be one of their selections. Olive Films is a company that I really cherish in the reality they give forgotten pieces of cinema a new outlet and a chance to be viewed by a new generation. They are a company that understands the importance of cinema and also a company that lovingly creates that new outlet of cinema with top notch DVD’s and Blu-ray’s. Chuck Norris, the man himself. What can be said that hasn’t already been said about the karate, action legend of cinema? An iconic master of pop culture and 80’s memories. In this he plays the character of Max alongside an equally wonderful actor Louis Gossett Jr. as the character Leo. Both are shinning stars. Gossett is a passionate, powerful example of acting excellence throughout his long career. I have always loved his ability to create memorable characters. He has always owned his performances, from the classic masterpiece series Roots, to the simple Drive-in action films like Iron Eagle and to my personal favorite 1985’s Enemy Mine. Firewalker is equally another one of those films that stand out in the Drive-in nature of cinema. The best way to describe Firewalker is a perfect example of an action Drive-in flare with wild over the top scenarios that only the 80’s could birth in cinema form. After Indian Jones fame many films adventured in the realm of treasure hunter, archaeologist, and adventurer. 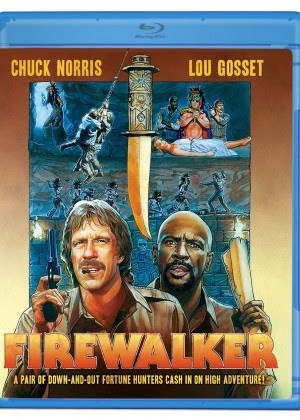 What makes Firewalker different is this was the first time that Chuck Norris intentionally stepped into a role of comedy mixed with action, kind of poking fun of himself and his films. This became the first time that he in reality made fun of himself or at least the roles he had always played. Directed by J. Lee Thompson. Thompson is a master of film making, directing some truly extraordinary pieces of cinema such as the wonderful WW2 film, The Guns Navarone. He also directed the dark, suspense filled masterpiece, 1962’s Cape Fear. He directed one of my favorite sequels and favorite film's of the Planet of the Apes series, 1972’s Conquest of the Planet of the Apes. He also directed another, much underrated film, and one of my favorite Charles Bronson films, 10 to Midnight. He would work with Bronson many times from Messenger of Death, Kinjite, The Ambassador, St. Ives, The White Buffalo, Cabo Blanco,The Evil that Men Do and Murphy’s Law. He would also direct some of the great Drive-in films of the 80’s such as, 1985’s King Solomon’s Mines, Death Wish 4, Happy Birthday to Me. J. Lee Thompson had a long and great career. Sadly he is no longer with us, but he left awesome pieces off cinema and Olive Films has honored his memory with releases of his movies, which is always a plus to own. Firewalker is one of those 80’s Drive-in actions films that is truly awesome to add to any Blu-ray collection. Also starring the very beautiful and stunning Melody Anderson, the main female role and mystery woman Patricia. I have always been a huge fan of hers. To me her shinning role would be in the 80’s classic Flash Gordon playing Dale Arden. She also played the character of Janet in one of the much underrated horror films of the 80’s, 1981’s Dead and Buried. No longer an actress, but now a Social Worker. She does make appearances at movie and comic conventions at times. I think it’s sad she no longer acts for she was a wonderful performer and the role of Patricia shines and stands out. Co-starring the always wonderful John Rhys-Davies who always plays a side character or someone who is equally a pivotal part of the film, just in small doses. To me he is an iconic actor that has graced the cinema world for many years both small screen and large screen. In the classic days of the 80’s it would be the Indiana Jones series. I think most notably this day and age as the character of Gimli in Peter Jackson’s Lord of the Rings Trilogy. As of this writing he has acted in over a whooping 230 performances. Always a passionate performer. He plays the part of Corky in Firewalker no different. Firewalker is one of those movies people misunderstand. This is a film of the 80’s, pulp, action, Drive-in flare, and that is its beauty. It’s, simply fun, and should be looked at as a popcorn film. When it came out, critic’s killed it and still kill it. I adventure into it like a Drive-in, popcorn, action film with treasure hunters, comedy and over the top fights. I think the problem with a lot of reviewers, they don’t understand the basis of certain films. Reviewers tend to rate films all together, which I don’t. To place a film like Titanic in the same rating system of Attack of the Killer Tomatoes, is Ludicrous and stupid. You have to place each film in the category and rating system of each genera. Titanic would be one of the great Main Stream dramas and equally a masterpiece of film making. Attack of the Killer Tomatoes has to be placed in the B-grade setting and cult Drive-In flare of cinema. It would be a masterpiece of B-movies. That is how films should be looked at, what does it offer and what rating does it have in its category of cinema. That is how you respect cinema of the lower class and upper class. Lot’s of 80’s films are often overlooked or torn apart by critics that don’t understand the style of where that film belongs. Firewalker is a great, Drive-in, B-grade piece of simple perfection, of simple entertainment. Yes it’s a rip off of every action adventure film, as the critics say, but so what. Olive Films did a lovingly job bringing this to Blu-ray. I love my popcorn cinema, and Firewalker is a perfect popcorn film. The Blu-ray is awesome, and I could not ask for anything more. Last night, I popped me some popcorn, turned the lights off and entered the 80’s of cheesy entertainment, I laughed and loved it, and most of all was entertained by it, just like I was when I was child at the Drive-In sitting on a blanket looking up at the huge screen. Fun entertainment. Olive Films did this film justice and perfected the film on a new outlet. Highly recommended Blu-ray. For the fans of Chuck and the 80's, Olive Films shinned with top quality perfection. I am reviewing the Blu-ray, but it is also on DVD.